Vancouver, BC - Skyharbour Resources Ltd. (TSX-V: SYH) (OTC Grey: SYHBF) (Frankfurt: SC1N) (the “Company”) announces it has arranged a non-brokered private placement to raise up to an aggregate of $400,000 by the issuance of 8,000,000 flow-through units (the “FT Units”) at a price of $0.05 per FT Unit, each FT Unit being comprised of one (1) flow-through common share (a “FT Share”) and one (1) non flow-through common share purchase warrant (a “NFT Warrant”) exercisable into one non flow-through common share (a “NFT Warrant Share”) for five years at an exercise price of $0.10 per Warrant Share. All the securities issuable will be subject to a four-month hold period from the date of closing and the private placement is subject to the approval of the TSX Venture Exchange. Skyharbour’s insiders plan to subscribe for up to $200,000 of the flow through financing for a total of 4 million FT Units. An insider who is neither a director nor an officer of the company has sold 3 million shares to an arms-length institutional investor and will use all of the proceeds from this sale to participate in this financing. 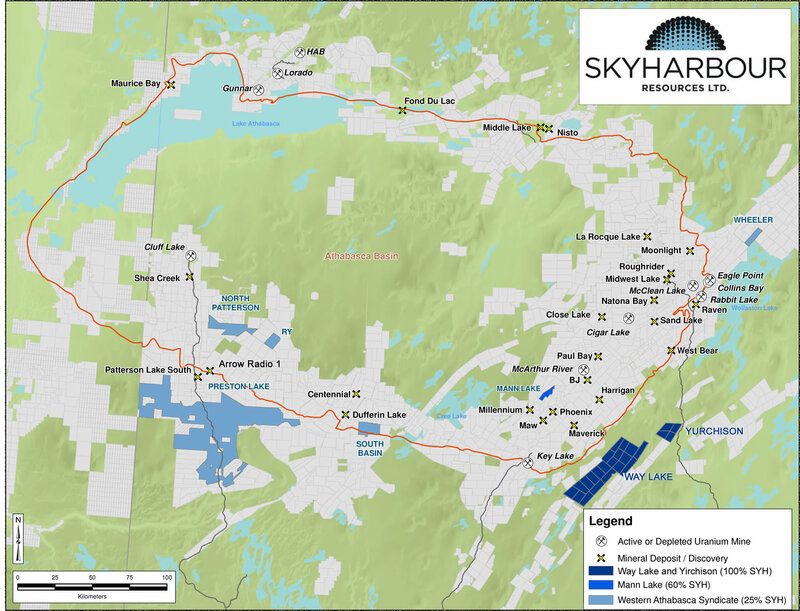 Skyharbour Resources intends to utilize the proceeds from this private placement for its continuing exploration programs on its Athabasca Basin, Saskatchewan uranium properties including additional field work at its 100% owned Falcon Point Uranium Project as well as at the Preston Uranium Project proximal to Fission Uranium and NexGen Energy’s high-grade discoveries. A finder's fee of up to 7% cash and 7% non-transferable warrants (the "Finder's Warrants") may be paid in connection with part of this private placement. Each Finder's Warrant will entitle the finder to purchase a common share at a price of $0.10 per share for a period of five years from the closing date of the private placement.